Metropolitan Moses was born in San Jose, California in 1955. Both of his parents were devout Roman Catholics. 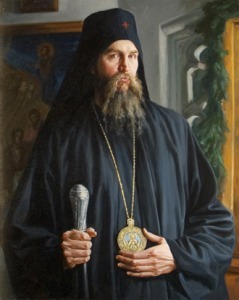 He converted to the Orthodox faith at the tomb of Saint John Maximovich, and was greatly influenced by the writings of Saint Philaret of New York, being made a catechumen at the Old Cathedral of the Russian Orthodox Church Abroad in San Francisco on Fulton Street in 1975. In the same year he traveled to Holy Transfiguration Monastery in Boston and was baptized there and remained as a novice. He was tonsured a monk in 1978 with the name of Moses for the holy Prophet Moses. After fulfilling various obediences at the monastery, in 1992 he was ordained deacon, at a time when the monastery was under the synod of Archbishop Auxentius. In 1996, on the feast of Mid-Pentecost, he was chosen by lot to be ordained a bishop. Thereafter he was ordained priest on the Feast of the Ascension, and consecrated bishop on October 7/20, 1996 as the Auxiliary bishop of Roslindale. Later, in December 2001, he was enthroned as Metropolitan of Seattle. In March of 2007 he was transferred to the Metropolis of Portland as a result of his efforts to initiate a discrete investigation into the activities of one Archimandrite Panteleimon Metropoulos. Three of the five bishops of the HOCNA Synod who were present at that meeting, (Metropolitan Moses, Bishop Sergios and Bishop Demetrius) understood that the only canonical path forward after this decision would be to enter into full communion and membership with the rightful Archbishop of Athens and His Holy Synod. The two other remaining bishops of HOCNA chose to establish a splinter group jurisdiction that claims to be an autocephalous church with headquarters in Boston, furthermore asserting that they are in no way accountable to any synod of bishops in Greece. Eventually close to 85% of the clergy and laity of HOCNA departed that jurisdiction and joined the Church of the Genuine Orthodox Christians of Greece. Soon after the 2010 decision of the Synod of HOCNA to withdraw any claim to the throne of Athens, Archbishop Kallinikos I, was duly elected the rightful Archbishop of Athens. On May 1/14, 2011 Metropolitan Moses was received into the canonical Church of the Genuine Orthodox Christians of Greece, presided over by the rightful Archbishop of Athens, His Beatitude Kallinikos I, in the historic church of Saint Nicholas at the monastery dedicated to that saint found in Paiania, Attica. On Thursday November 2/15, the Holy Synod of the Church of the Genuine Orthodox Christians met in a regular meeting, having, among other things, the issue of the reorganization of the Church of the G.O.C. of America, after the massive entrance of hierarchs, clergy and established parishes from HOCNA in the previous months. The Holy Synod addressed this issue in previous meetings as did the Holy Eparchial Synod of America in the past three months, so that it could take into consideration all the parameters before coming to a definite decision. a) The Holy Metropolis of Toronto is founded, which encompasses the territory of southern Ontario. The Metropolis is sovereign and His Eminence Metropolitan Moses of (until now) Portland is elected as Metropolitan of this newly-founded Metropolis. b) The sovereign Holy Metropolis of Portland is converted into a Diocese with the same name and canonical boundaries (the western United States). The Holy Diocese of Portland is subject to the Metropolis of America. His Grace Bishop Sergios of Loch Lomond is raised to the rank of Eparchial Bishop of Portland. From the time of this decision of the Holy Synod of the GOC Metropolitan Moses has been serving the flock of Toronto until this day.